All our special rates are with 2 buffet breakfast, local tax and service charge for 2 adults/room/night. 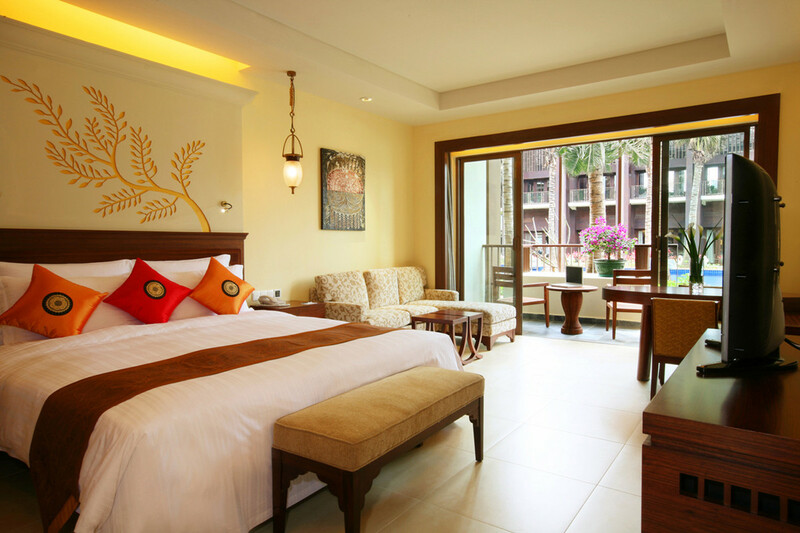 Extra bed: CNY550/night with 1 person's buffet breakfast, local tax and service charge. Extra adult breakfast: CNY180/person/day (above 12 years old). Extra child breakfast: CNY90/person/day for children 6-12 years old. Pullman Villas & Resort Sanya Yalong Bay, not right on the beach, but with big tropical gardens and nice pools. Located on Yalong Bay, 30 minutes driving from Sanya Airport, 20 minutes driving to downtown Sanya, about 5 minutes walking distance from Yalong Bay Beach, buggy service available to the beach free of charge, 10 minutes walking distance to Yalong Bay food street near Huayu Resort. Not right on Yalong Bay Beach, but guests use beach beside Ritz-Carlton Resort with full services including bar & water sports. One main building with normal hotels rooms overlooking hotels pools and garden, 115 exclusive resort villas in different styles. All villas are with private garden, pools, sitting rooms, massage sala and internet access. Big tropical gardens and nice pools.